I can’t bake for the life of me. My cookies crumble, my cakes fall. After early attempts, I just don’t bother with baking any more. This year, for my sister’s birthday, my brother and his wife were hosting a dinner with home-cooked Chinese comfort food. Not the dishes you see on restaurant menus, but the full-flavoured, pungent, everyday peasant food our mother and grandmother made when we all lived under the same roof. 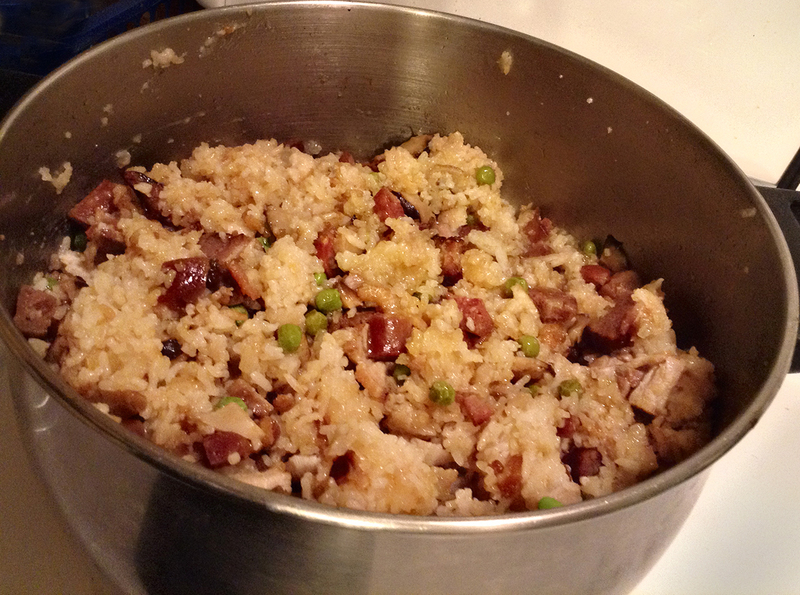 Dishes like sticky rice with Chinese sausage, mushrooms and peas (above), pork with fat rind steamed in salted shrimp paste, and oxtail stewed in mystery sauce. Dishes considered too base and homey for restaurant fare. I fretted, checked recipes online and cringed at the work involved – creaming and beating and a big bowl and a small bowl and timing and mixing. 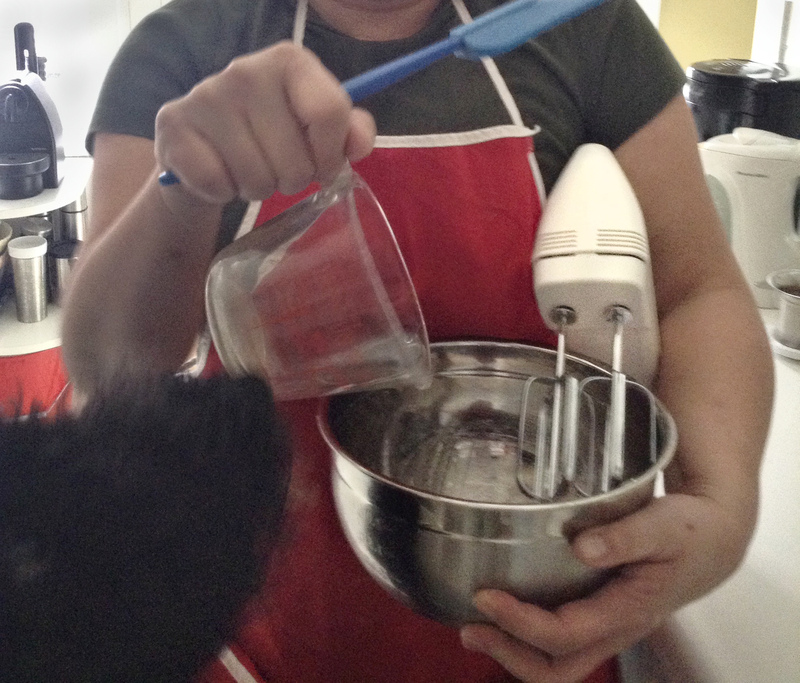 C’mon, one hand holds the mixing bowl, the other holds the beater, whose hand is doing the drizzling? A few days later, my neighbour down the street, who’s originally from Tennessee, invited me to lunch. “I can’t,” I said, “I have to bake a birthday cake for tomorrow and I don’t know how.” “It’s easy,” he said, “Let me give you my never-fail, secret family recipe.” And he did. And it did sound easy. So I took a rain check on lunch to bake a cake. I had one round cake pan. I turned to my next-door neighbour for a second one. “Your pan is a bit smaller than mine, I’ll need to buy another one,” I said. “What’s wrong with the top layer being a bit smaller than the bottom?” she said. Well why not? Out shopping for cake ingredients, I ran into my Tennessee neighbour’s daughter. This was a good omen. I felt propitiously optimistic. That evening, I baked. It had been a busy day and I was tired. I dozed off with the cakes in the oven. Luckily only the edges were burned, though the bottom cake rose higher on one side. I cooled the cakes outside and reviewed my cake strategy. My next-door neighbor was out with her dog. “Our local bakery is open 24 hours. I bet they could have a cake for you by morning,” she suggested. Of course – a back-up cake. Back in the house, I cut off the burnt parts, glued the two cakes together with jam and covered the thing with supermarket frosting. 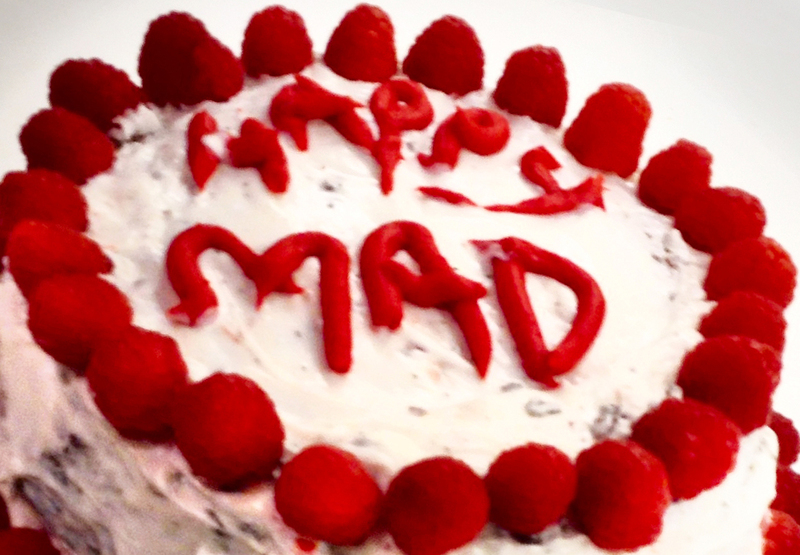 I started to write “Happy Birthday Madeline” on the cake but had to settle for “Happy Mad”. Looking at the finished cake, I thought, “Seussian”. 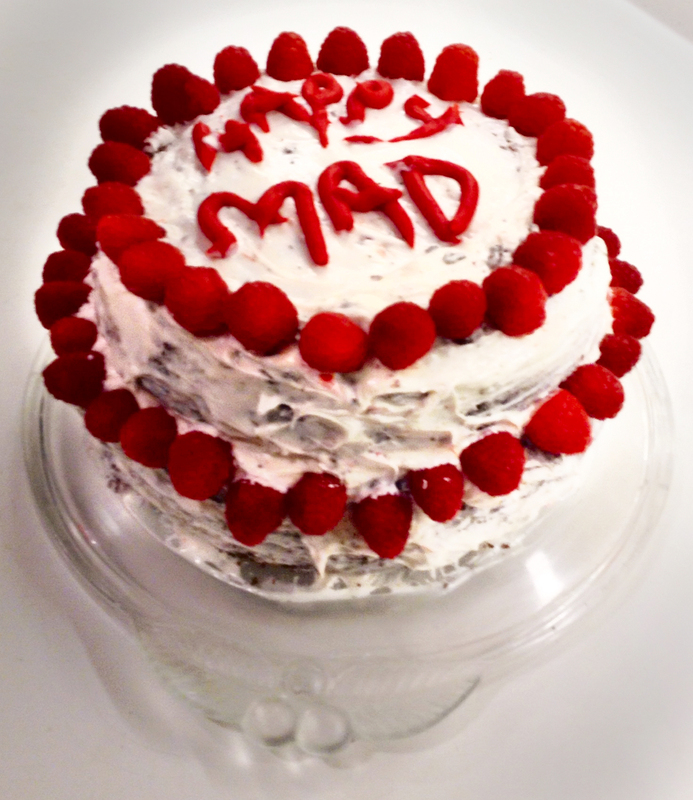 At midnight, I placed a call to our local bakery and ordered my back-up cake. The next day, dinner was delicious. Each taste brought me back to my childhood, where we ate huddled over a table in our small dining-living-homework room, not realizing then how rarely we would have these dishes in the future. Now, here they were, spread on the table, buffet style in my brother’s large Markham home. Then came dessert. The tooth-achingly sweet frosting could not rescue the bland cake from crumbling into sawdust in my mouth. What the hell? Does the bakery keep month-old spare parts to fill emergency orders placed at midnight? Then we cut into my wonky cake. The inside looked like cake. In contrast to the bakery confection, it was moist and chocolaty, not too sweet, inoffensive, good even. Everyone congratulated me on a cake well baked. Good strategy, bringing that bakery cake.